Today we had a neighborhood Easter Egg hunt and my daughter wanted a special "something" to wear. 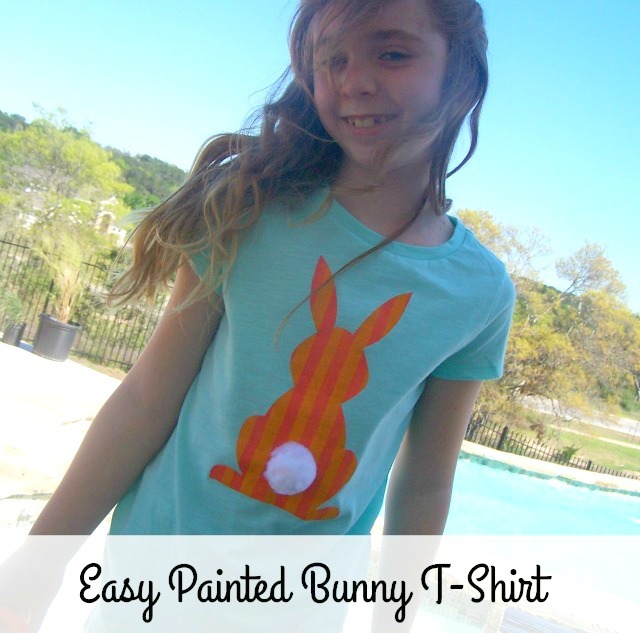 It was a pretty casual party so I decided to make a Bunny T-Shirt inspired by my Bunny Banner. Now of course, I had my own ideas...but my daughter had HER OWN ideas too. She won (mostly) and I admit her idea to put stripes on the bunny was a good one! Optional: white pom pom an safety pin or fabric glue OR ribbon and safety pin or fabric glue. Print out the template. 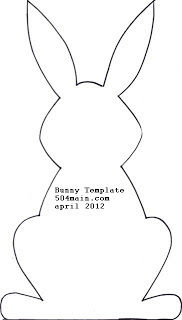 I used the size as is, but you can resize the bunny. A. 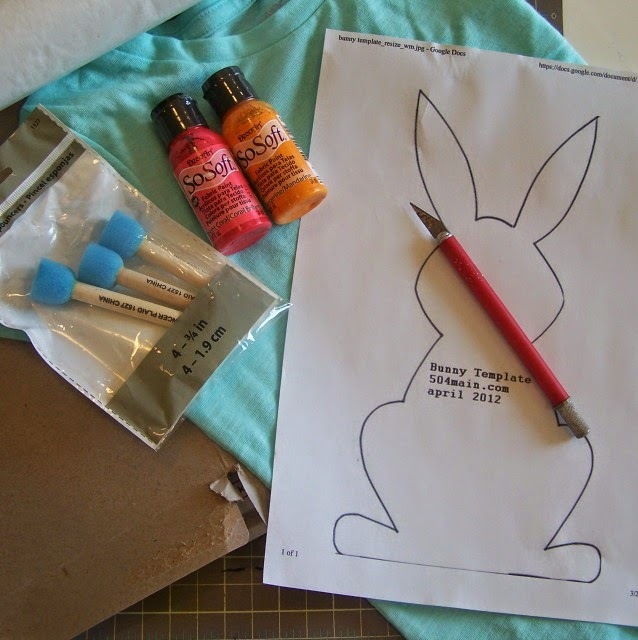 If using cardboard, trace off the bunny shape and cut it out in the cardboard. You should have a square of cardboard with a bunny shape in the center. B. This is what I did...use freezer paper. On the non-waxy side (in this case it does not matter as much because the design ins symmetrical, but in some cases it would matter what side you trace the shape on) trace the shape. I taped the template to my cutting mat and then taped the freezer paper over it. 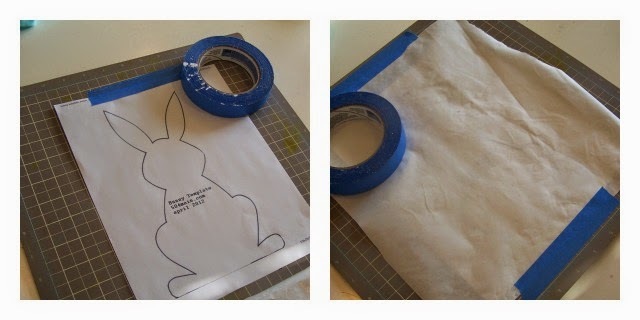 I could easily see the bunny shape and then I cut it out with an X-ACTO knife. 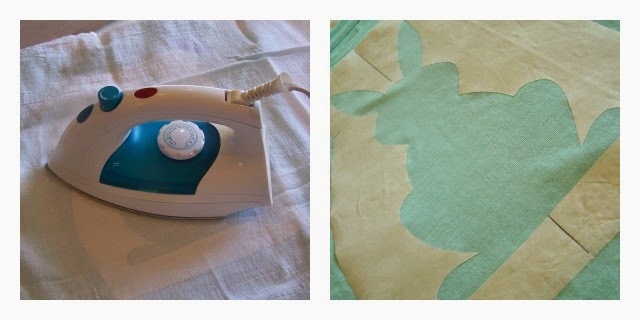 Heat the iron to cotton. 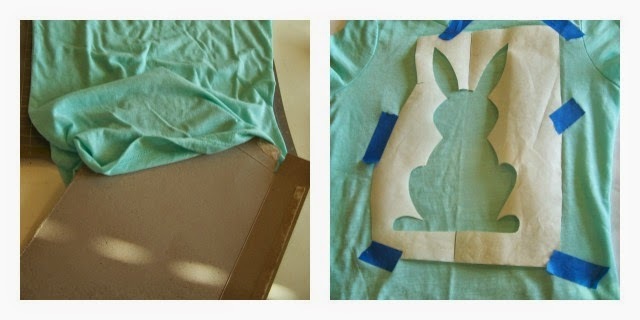 Fold shirt in half and press to show the center of the shirt (this helps you get the design centered). 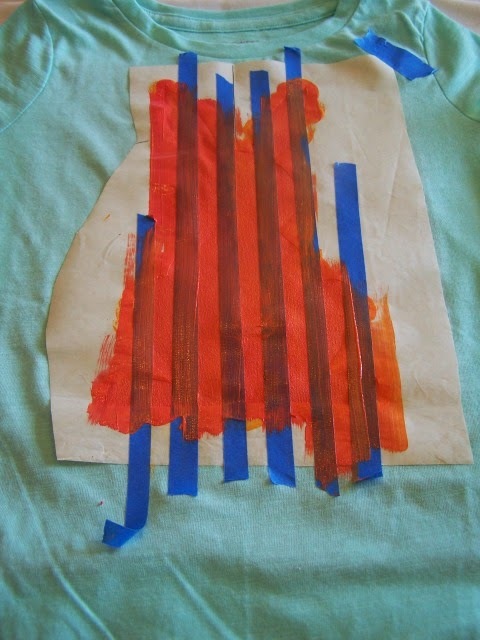 Place a piece of cardboard inside the t-shirt (to prevent the paint from soaking through to the back of the shirt. 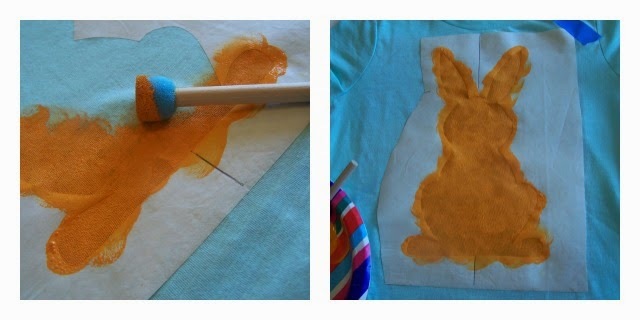 Place a cloth over the t-shirt and press the (freezer paper) stencil to the shirt - with the WAXY SIDE DOWN. I PRESSED IT IN THE CENTER FIRST TO GET IT TO STICK, THEN REMOVED MY MASKING/PAINTERS TAPE. Press the freezer down all over. Remove pressing cloth. 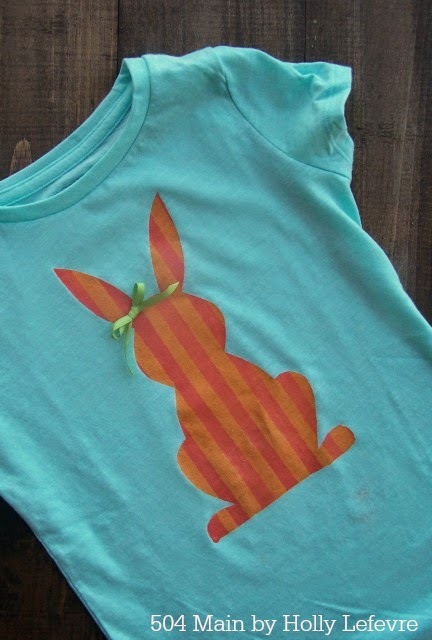 I was going to paint the bunny one color, but my daughter insisted on stripes. At first I was like "Really?" but I think it turned out so cute! 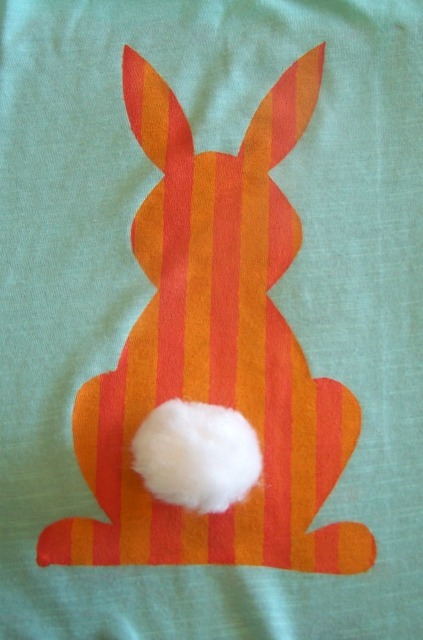 Use the Tangerine (or the lightest color you are using) So Soft and pounce the color all over the bunny. Let dry (it doe snot have to dry completely, but needs to be pretty dry). Using my X-ACTO and painters tape, I cut the tape in half, giving my about 1/2" strips of tape. I lined the first one up with the center of my design and then just eyeballed the rest, making the stripes about 1/2" all around. 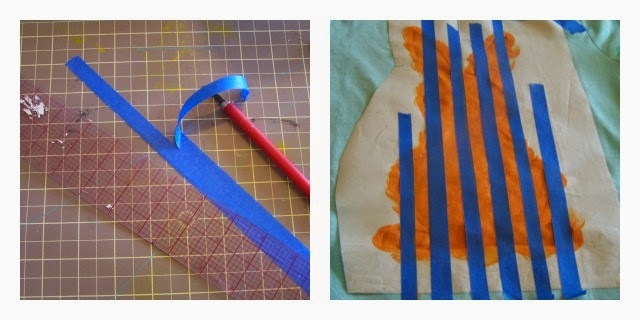 Using the Coral (or your darker color) fill in the areas not taped off. 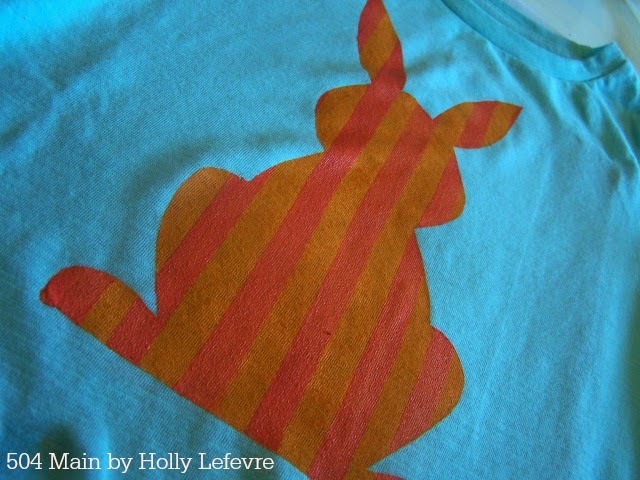 Remove tape and freezer paper...and Voila! Some ribbon for her ear..or for a bow tie (for a masculine touch). 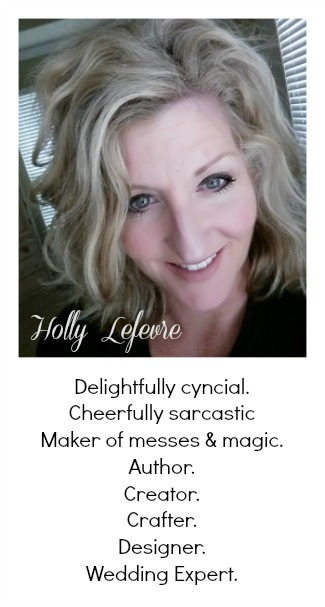 NOTE - I used a safety pin to attach my accessories so that the t-shirt would be easier to wash.
Is she, I mean, the t-shirt adorable! 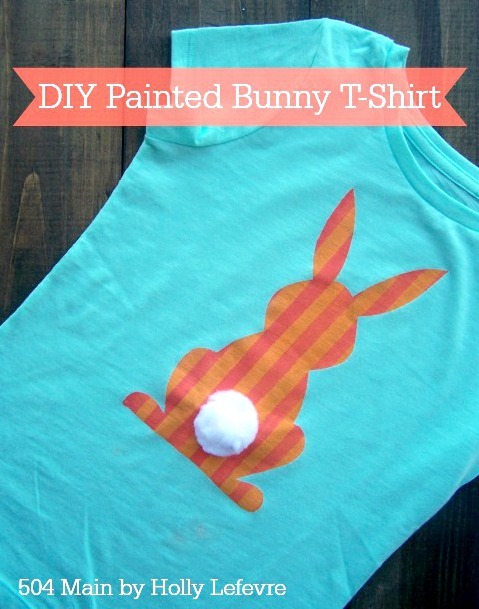 Want to try another easy Bunny craft? 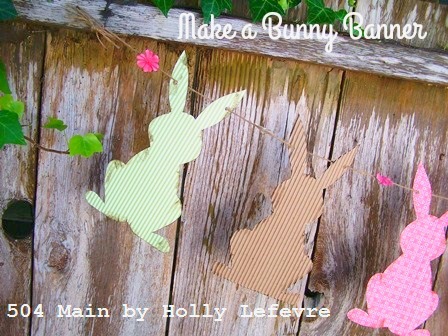 Check out this Bunny Banner!